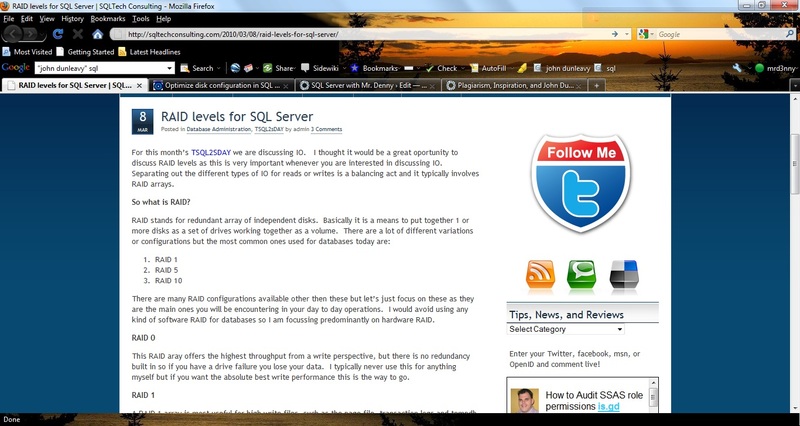 So until just a few minutes ago the problem that everyone had with the blog written by John Dunleavy, who is the owner of SQLTech Consulting, was that he was taking the first part of whitepapers and posting them, with links to the original work, which John defended. However then Paul Randal pointed out John’s entry into this months TSQLTuesday. It would appear that a good portion of John’s post were taken directly from an older article which I wrote. Below are screen shots from John’s blog. 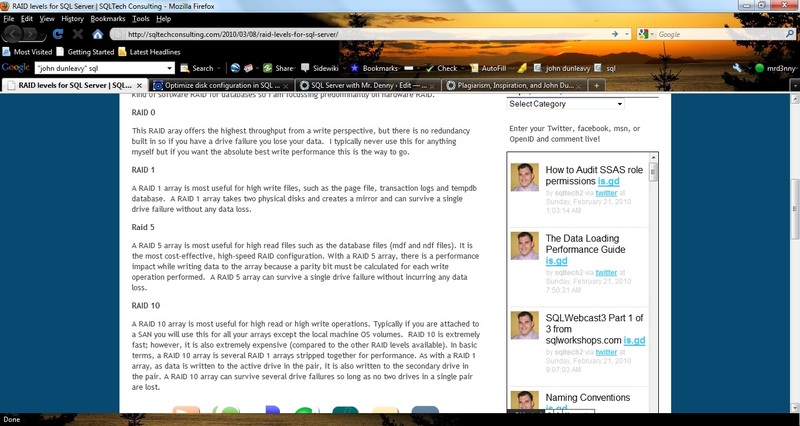 I’ve underlined the parts which are taken directly from an article which I wrote a couple of years ago titled Optimize Disk Configurations in SQL Server. You’ll find the matching content about half way down. Now if you compare those sections to the RAID level descriptions that I posted in my article you’ll find that they match way to closely to be by accident. Hell the RAID 5 one matches word for word, and the RAID 10 one is pretty damn close. 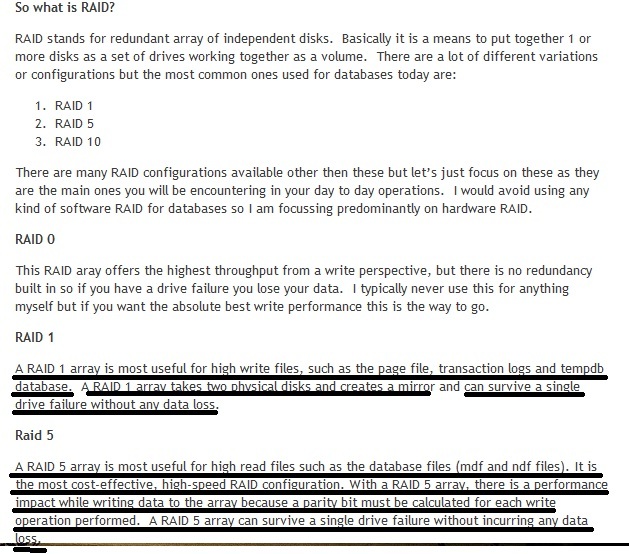 The best part is John apparently didn’t finish my article, he just got to the parts he needed to swipe and stopped because in his RAID 10 description he says that if you are attached to a SAN you’ll be using RAID 10 for everything, and he even says that RAID 0 is find for ultrahigh write databases. Where in my article I say that RAID 5 or RAID 6 will work fine for most, then move up to RAID 10 if you need the higher write throughput. Now, yes you could say that it’s RAID, how many ways are their to describe it, so it could just be chance. However note that the punctuation matches, including the placement of the semi-colons. It really isn’t very likely that this was an accident. Even if posting unattributed copies of others works with links back was ok, flat out stealing content from their site isn’t. Needless to say I was less than impressed when I saw this. In case you were wondering stealing someones content is not flattery. At all. P.S. In case you are looking for the unchopped version of this blog post, I’ve included screen shots below in case his post is removed from his site. I am really sorry Denny. I pulled the definitions in my TSQL2sday article from a document I had on my computer from a long time ago. I thought I was the one who wrote it so again I appologize for any misunderstanding.